The 2013 Pickathon Festival in Happy Valley, Oregon just outside of Portland has announced their 2013 lineup, and it is a doozy. The roots festival that specializes in breaking down barriers between styles, tastes, and scenes, as well as being one of the most environmentally-friendly festivals in the entire world, outdoes themselves for their 15th season by releasing their most stellar lineup yet. Pickathon transpires August 2-4 on the beautiful Pendarvis Farm. 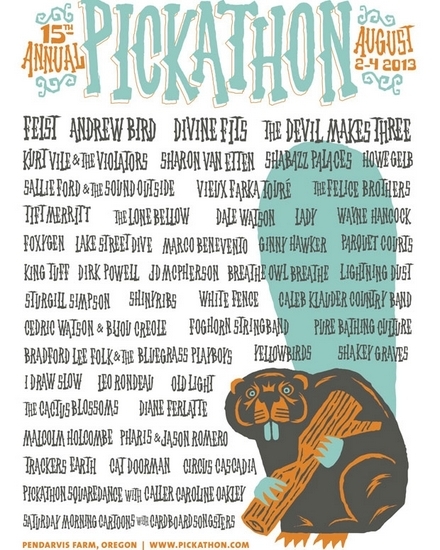 For more info and tickets, visit www.pickathon.com. Shakey Graves is from Austin!! I’ve seen him a couple times and he’s pretty good. Wish I could make it all the way up there for all the other bands. how does Shabazz Palaces fit into Pickathon? The great thing about Pickathon is that everything fits into Pickathon. Billboard is now incorporating all official videos on YouTube captured by Nielsen’s streaming measurement, including Vevo on YouTube, and user-generated clips that utilize authorized audio into the Hot 100 and the Hot 100 formula-based genre charts ”“ Hot Country Songs, Hot R&B/Hip-Hop Songs, R&B Songs, Rap Songs, Hot Latin Songs, Hot Rock Songs and Dance/Electronic Songs ”“ to further reflect the divergent platforms for music consumption in today’s world. Also would that mean the underground artists can get #1 songs by replaying their songs 1000 times a day? Interesting. I remember when the new sweeping Billboard rules took effect, Billboard editor Bill Werde said they were looking into using YouTube views in their charts, but that they needed to figure out how to get “clean data” from the format. It appears they’ve now figured out how to do that. And no, I’m not sure that means you can play songs over and over and get them to chart. Similar concerns were made about Spotify and other streaming services, and I think there are ways to take that into consideration. Every web metric has hits, and unique hits. Hits are how many times anybody listen to a song. Unique is how many unique users listen to it. Like with this website and others, the metric most things are judged on is the unique hits. I’ll have to think about this more, and what impacts it might have. Thanks for the heads up. What I meant was, listen to the song and then repeat it over and over again. I was going to email this, and not take over a post. But I couldn’t get it to send. The #1 song is the “Harlem Shake” because of 30 second parody videos.. If this was implemented last year Gagman style would of been #1 for months cause of the 1 billion views it got. I’m working on an article about this. Yes, the contact form is apparently on the fritz. We’re working on it. Bill werde even replied to someone asking if anyone can make a song, and get on the hot 100. Sounds like if any artist is on youtube they can rechart. How crazy would it be to get Hank Williams a top hit in this day and age. We’ve been going for nearly the entire run of Pickathon (skipped it for our wedding ~10 years ago). I’m continually amazed at the lineup. It’s a great venue that really puts you close to the artists. Unfortunately, I think the price is going to start chasing people off. Another OR event to watch is the Wildwood Music fest http://www.wildwoodmusicfest.com/ . Very similar to Pickathon in the early years, with a good lineup this year. The price is too much for me. I am going to look into volunteering at the fest because it does look like a dandy and I have been sad to miss it these last few years. But if that doesn’t work out then no go. Volunteering is a great way to go. I have a lot of friends that volunteer over the weekend and it”™s a great experience. You still get plenty of time to watch bands and hang out. It”™s really inspiring to see the volunteering culture around Pickathon, and I am blown away at the lack of a volunteering spirit when it comes to other festivals. Even with an expensive festival like Pickathon, this is all going to the artists and throwing the festival, so if you can pay, then volunteer, because this is the only way these non-corporate festivals can continue to exist.